View of a house near Tintern Abbey. Tintern was the wealthiest abbey in Wales, owning many estates. Most of the local people worked for the Abbey. By the 18th century, the area was a mixture of impoverished local people and wealthy tourists, living side by side. 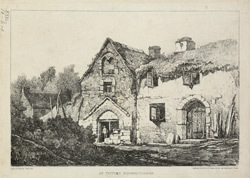 William Coxe, a clergyman who visited Tintern around 1801, wrote of reaching the abbey after "passing a miserable row of cottages, and forcing our way through a crowd of importunate beggars".